With Yahoo as my source I downloaded all their data on the S&P 500 index. That’s data from the start of 1950 up till today. I feel it’s important to check if the effect is equally reliable for both up and down moves as there’s 43 positive years and only 18 negative. So ignoring the negative predictability would be rather stupid with such a positive bias. Then again I guess one could argue there’s not enough data on the negative side, but it’s all we’ve got. That doesn’t look too bad. 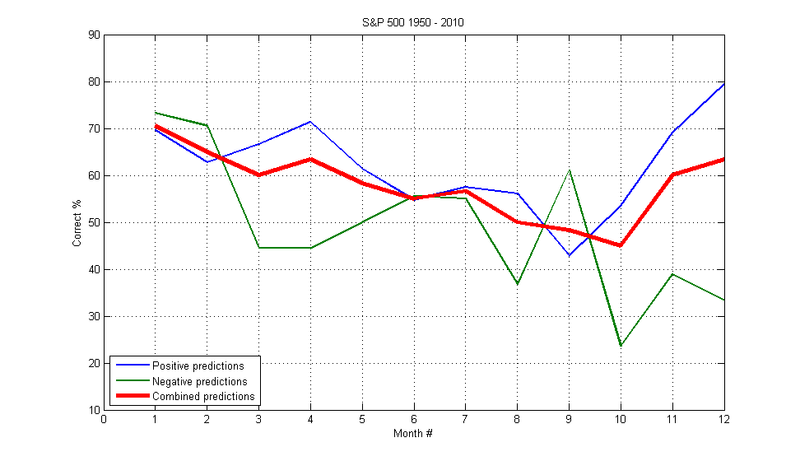 Both the positive and negative predictability power is even and at around 70%. 50% would be like flipping a coin, and anything consistent above 60% wouldn’t be too bad. But what about the other months? Could market trends be so slow in general that we would see similar results for the other months? According to the EMH there shouldn’t be consistent arbitrage opportunities like these present. In other words, there shouldn’t be any consistent structural breaks available for exploitation and I should be free to analyze the other months similarly. By taking the data and shifting it one month forward (in addition to cutting it a year at the end to maintain balance), I performed the same analysis for the other 11 months. So, does February predict the returns for the next 11 months, etc.. The results are shown below. 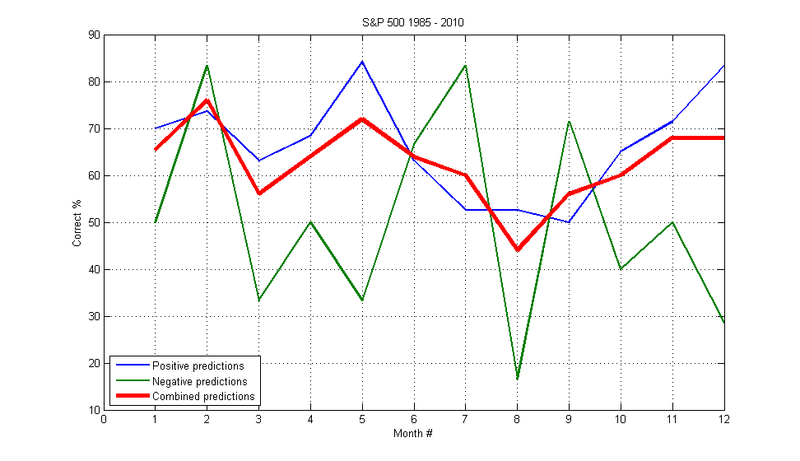 There seems to be a clear reductional trend in predictive power as we go further out, with diverging behavior at the end. But besides from that last part, this is what I guess we could expect from the January barometer. 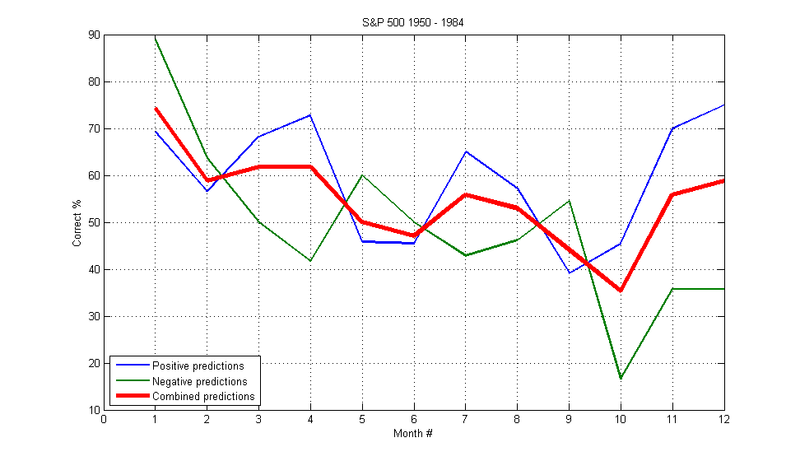 January results contain predictive properties for both positive and negative directions while the other months show weaker or no predictive power. But is this the complete story? I’m not so sure, as there’s been people talking about a loss in this predictive power over time. So let’s check the data ones more, but now by splitting it into two periods: One from 1950 till 1984, the other from 1985 till 2010.